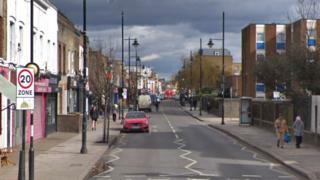 A man has been injured after a substance, believed to be ammonia, was thrown at him in east London. The 29-year-old victim was targeted at about 17:40 GMT on Roman Road, Tower Hamlets. Scotland Yard said the man had been taken to hospital but had not suffered serious injuries. An investigation is under way but so far no-one has been arrested in connection with the attack, according to the Met.